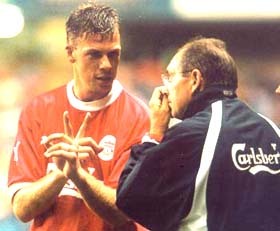 Erik Meijer - The big Dutchman - LFChistory - Stats galore for Liverpool FC! Erik Meijer is still a popular figure with Liverpool fans because of his fighting spirit. 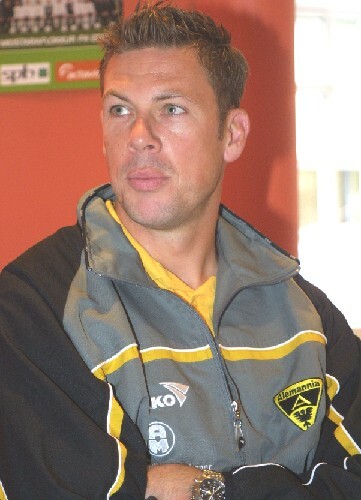 The BIG Dutchman is now the captain of 2nd division Alemannia Aachen in Germany and he spoke exclusively to Arnie, editor of LFChistory, about his Liverpool career. When your name is mentioned, it’s quite evident that you’re still quite a popular player with the fans. Why do you think that is? I hope it is because I give the impression that I always wanted to work as hard as possible when I was wearing that red shirt. I was proud to play for Liverpool. I had to compete with three other strikers, Owen, Heskey and Fowler. They were all better than me, so I had to make the decision to either sit and watch football or go somewhere else and play football. You always seemed to give 110% in each game you played. Screaming and encouraging the other players. Your presence on the field seemed to lift other players to a higher level. I hope it came out that way, because that's always how I play. I play the same way with Aachen. I am a player who can make a team play better. I am not going to score 20-25 goals a season. That is not me. But I am a player who makes other players feel more comfortable and use me to get better. How do you look back at the time when you were playing with Liverpool? A very positive period. I was there for one and a half year and liked it from the first moment I stepped in. I was a Liverpool fan when I was a kid and when the club asked me to play for Liverpool I didn't need much time to put my signature on that contract. It was done in one week and I was very proud to be there. How did you like working under Houllier? He was a very good manager. In his second year, after I had left in the winter, they won five trophies. He could be very hard, but fair. I didn't leave because of Houllier. He could only play 11 players and have six or seven players around the squad and I wasn't there for the last couple of months. I then decided to go somewhere else. That killed me, because he is more or less the same structure, the same kind of player. A big guy up front. That's always in football, one comes, another one has to leave. Unfortunately that was me, but the show must go on. I had good years at Hamburg. I am now 35 and still enjoying my football. Do you still follow Liverpool. Looking out for their results? Yes, I still follow them. They have a full schedule with Champions league so it's going to be a busy season with a new coach. Benítez is a good coach, who had some great results in Spain, but the fact is you also have to bring it over to England and it's not easy for foreign managers to get settled in England. Arsene Wenger has been a long time at Arsenal though, and as soon as you're settled, you're settled for a long time. Chris Bascombe said recently on a website, that he once had a minor altercation with you at Melwood, because he had written an article in Liverpool Echo about Liverpool's strikeforce at the time and had forgotten to mention you? If I don't like somebody I tell it in the their face. I am very honest with everybody. If they are fair to me, I am fair to them. I have no secrets. If I don't want to talk, I don't want to talk, that's it. I am okay with Chris, but when they only talk about the big names, you have to also put your name forward. Some Liverpool fans mentioned that they met you in Dortmund before the Alaves match and had drink or two with you. A few too much, yeah. I went over with some friends and they were all wearing a Liverpool shirt with my name and number on it. Some Liverpool fans were asking where they got that shirt. I had my jacket over my shirt. They answered: "Well, because Erik is here" and then the catastrophe started. I had to sing some songs for the boys. It was a great afternoon. One of my best times as a supporter, being on the big square and singing songs. Your stats with Liverpool are 27 games and 2 goals. Correct, that's one goal every ten games... [laughs]. It was a great start. The Hull game was the first game I started and I scored two goals and Liverpool won. It was a very good start, but it was just a start.